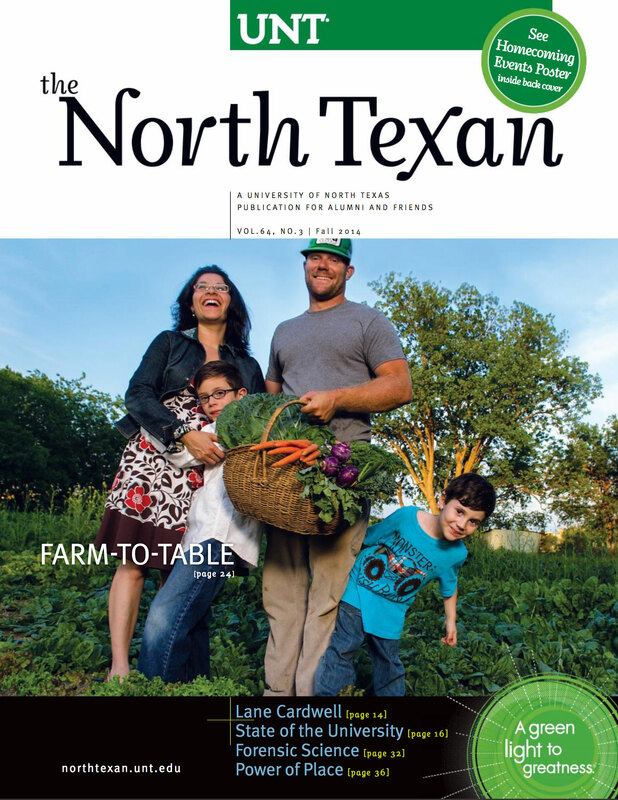 UNT alumni are part of movement to provide locally produced fresh food and create healthier communities. Mark J. Merki ('91, '91 M.S. ), CPA, shares why volunteering with Mentor Denton is important. Take your Mean Green pride on the road wherever you go with a UNT license plate. New action plan will guide UNT's yearly accomplishments. In their second season in Conference USA, Mean Green vie for another bowl win. UNT's newest facility gives fraternities and sororities a place to call home on Greek Row. President Neal Smatresk unveiled the top priorities for the 2014-15 year. Alumni use their scientific training to unravel mysteries of the past and help solve crimes. Hospitality alum shares winning recipe for building successful restaurant brands. Maggie Noel ('10) is attracting a new, diverse golfing crowd with her unique style. Jonathan A. Molina-Garcia ('14) won the Jack Kent Cooke Graduate Arts Award. The Silicon Valley icon shared his expertise as part of UNT's Distinguished Lecture Series. For Beth Ziesenis ('90), being nerdy has perks -- including making her a favorite speaker. Aleksander Hemon will visit campus five times during the academic year. The Diaz siblings settle in at UNT as they begin their college journey. Are medieval rock-cut temples in southern India sculpture or architecture? Students in the College of Information help libraries around the world. How can you use social media to advance your career? UNT launched a new Mean Green Pride campaign to celebrate wearing green on Fridays. Great things are on the horizon for the UNT Alumni Association, says Robert McInturf. UNT rolled out the welcome wagon for new students at First Flight Week. Mark Cuban backs computer science major's app, solar powered recycling and champion archer. Music alumna made her conducting debut as an undergraduate. J'Layne Sundberg (ʼ06) headed to Maai Mahiu, Kenya, this summer to teach orphaned children. I enrolled at North Texas in spring 1980 following a two-year stay at a junior college. In the 1980s, the coolest place in Denton to get breakfast was Jim's Diner. Gerard O'Donovan's death resurrects memories of an exceptional leader.